I recently engaged in dialogue with D. Stephen Long, Cary M. Maguire University Professor of Ethics at Southern Methodist University, about my recent book, Divine Currency. Long offered his review of the book in Marginalia: LA Review of Books, entitled, “Can Christians Be Capitalists?” Given the challenges and critiques he raises, I provided a response, “The Anxiety of Influence.” Check out the exchange! Prefer to listen to my lecture on “Greed and God” in Nijmegen, The Netherlands, rather than watch the video? Check out the audio track here on Soundcloud. This also has the advantage of containing the entire QnA, which was cut off on the video. 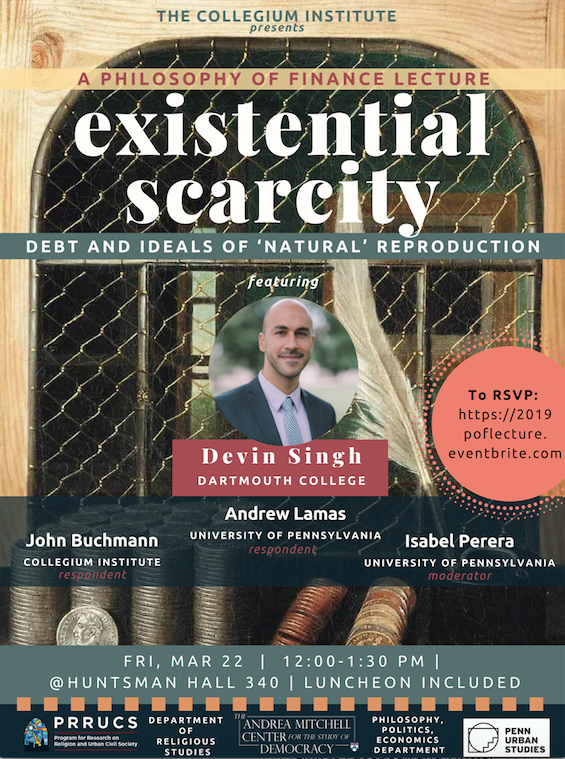 I recently participated in a book event for Adam Kotsko’s Neoliberalism’s Demons: On the Political Theology of Late Capital. Read my entry and the many great reviews, in addition to Kotsko’s response, here. I’m often struck by how little I see written about Gen Xers (1965-1980) in the workplace or Gen X leadership. There is, of course, a ton on our younger siblings, the Millennials (1981-1996), and still plenty coming out on our aging Boomer (1946-1964) parents. There’s even a lot of coverage on the tense relationship between those two! We Xers seem to have been left out of things, which, of course, totally fits our life experience. But why fail to consider the important challenges faced and contributions made by GenXers in the workplace? 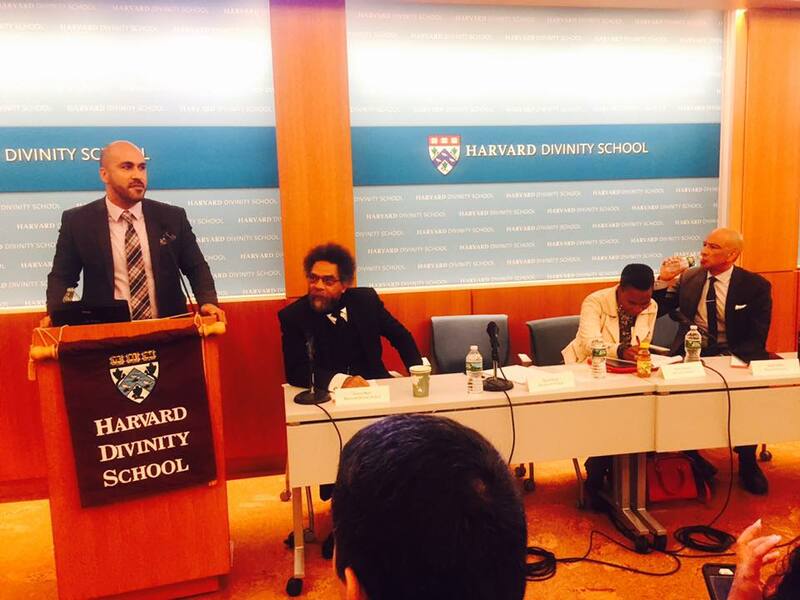 In this TCM mini-episode, we hear a short talk given by Devin Singh last November as part of the Race, Coloniality and Philosophy of Religion Unit at AAR in Boston. Devin has recently written a book Divine Currency: The Theological Power of Money in the West. We'll hear more about that in an upcoming episode... Stay tuned. I spoke with Zachary Settle of The Other Journal in this online interview about my book, Divine Currency. This summer I received word that I had been selected to participate in a Luce Foundation-funded project called Public Theologies of Technology and Presence, administered through the Institute of Buddhist Studies in Berkeley. 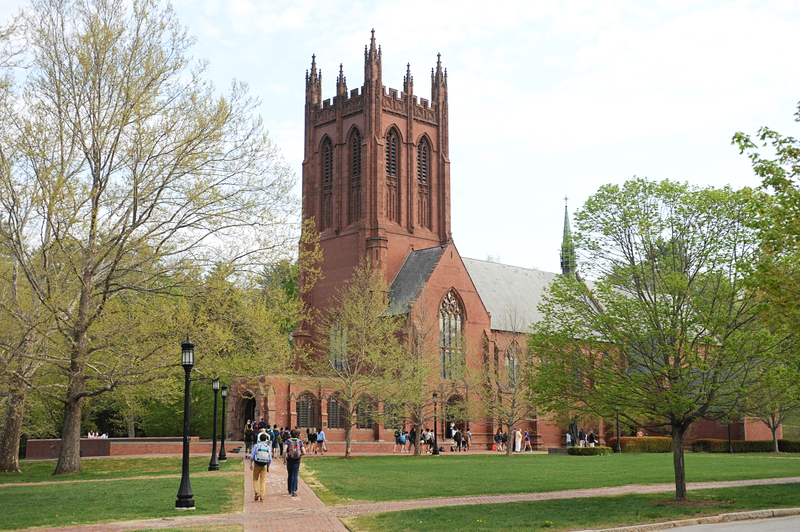 My project, “Decentered Sovereignties and Spectral Transactions: Cryptocurrency, Public Theology, and the Ethics of Presence” will examine the hidden ethical vision of cryptocurrency and evaluate its potential impact on community. Click the link to learn more! Money is significant in Western culture, and as the saying goes, money is power. But how did it become such a central part of Western life? 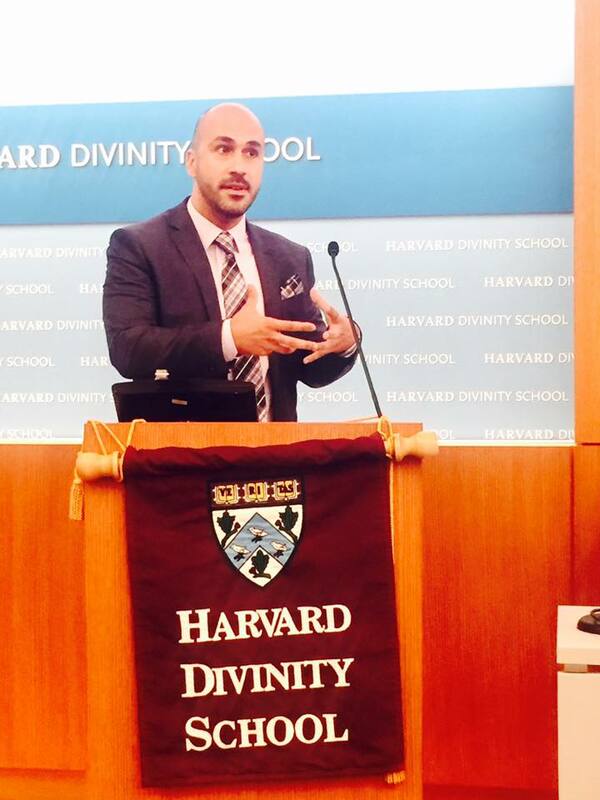 Dartmouth’s Devin Singh examines the religious and theological sources of money’s influence in his new book Divine Currency: The Theological Power of Money in the West. The Briefing Powered By Dartmouth on SiriusXM Insight Channel 121. Airs Saturdays at 8am EST, rebroadcast Sundays at 6am and 7pm EST. A lively hour dissecting the history, facts and perspectives shaping this week's news. Sirius Radio’s legal prevents me from posting the whole thing but feel free to message me for a file of the entire interview for your personal use. 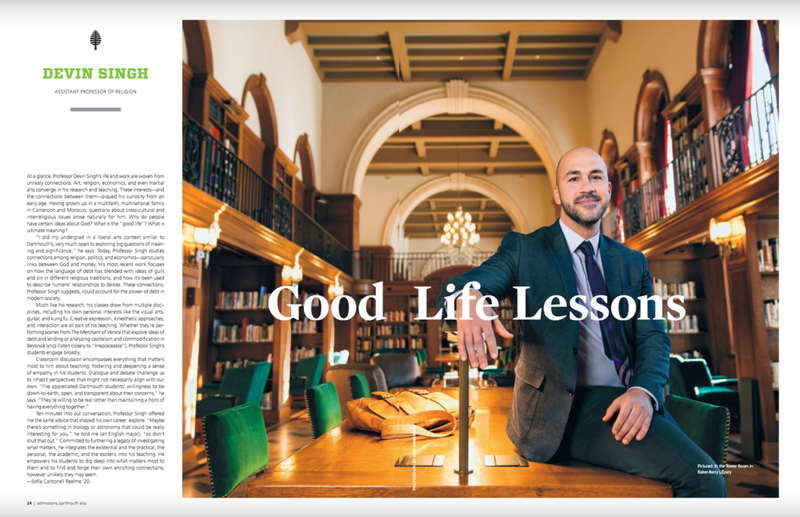 Last year I was interviewed by a Dartmouth student and this profile was recently published. Click the image for a link to a readable online version! 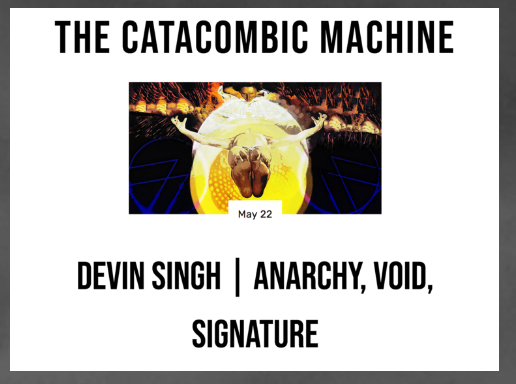 In this episode of The Catacombic Machine, Matt Baker and Preston Price speak with Devin Singh about his book Divine Currency: The Theological Power of Money in the West, among other things. As an extension of his fight against racist laws at home, Martin Luther King Jr. became increasingly critical of US policies abroad. Indeed, many speculate that King’s progressively strident critique of US militarism and intervention, particularly in Vietnam, and his challenge to American market priorities were factors that accelerated plans for his assassination—the 50th anniversary of which we recently marked as a nation. Among his many detractors were white clergy who, already incensed at King’s challenge to segregation and Jim Crow, were dumbfounded that he would move to oppose US warmongering and to call out the evils of capitalism. As King’s confrontation revealed, their theology was not only implicated in their racist vision of society, but also in a worldview that prioritized economic supremacy by any means necessary. Read more at the Stanford University Press blog. Is money transcendent or immanent? Some might suggest that money is the preeminent symbol of immanence. It enables exchange, the dyadic interface of two agents, passing values about on the same plane. It requires no “outside.” Money has supposedly become the be-all and end-all of our age, as the horizon of the good, and, as such, forges a closed, self-contained system. The modern era, the age of immanence, is also the age of money and capital, as economy has come to ground and delimit much of how we understand ourselves. Money and its preponderance appear correlated to the immanent. 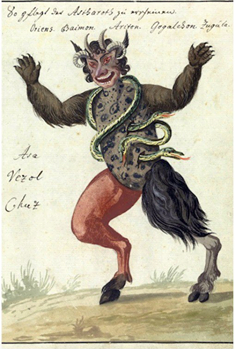 Others may counter that money appears irrevocably tied to transcendence. After all, money only works by serving as an abstract “third” position to mediate two incommensurate articles of exchange. Money signifies value, itself an ethereal category not fully exhausted by materialist definitions. Money “stands above” the plane of objects of labor, commodities, and use-values. Some might press further to claim that money has usurped the place of God in societal imagination, trading on theological residues to become the index for ultimate concern and even sovereign decision. Implied here is a critique of false transcendence. The immanent has overstepped its place. Which brings us full circle. Read the the full, original post at The Immanent Frame.